Tips for identifying a reputable breeder and how to avoid an unscrupulous or back yard breeder. You will notice in on-line advertisements that seemingly similar German Shepherd dogs have price variations of anywhere from $50 to $1000 to acquire a puppy depending on the breeder and the bloodline offered. You may like the idea of saving money at first by price shopping with different breeders; but, a lower initial purchase price may not reveal the true hidden costs of acquiring a puppy. Yes, by shopping around you may save a few bucks off the purchase price. However if you purchase from an inexperienced or unscrupulous breeder - what will it cost you in the long run? Don’t make the mistake of asking for pictures online and then sending a deposit based on those photos. Go visit, meet them in person, ask questions, make notes etc. Here is a challenge - accumulate all the information possible from our site, then go look again at the ads & pictures on that free online classified website, this should change your perspective. Unethical or novice breeders seeking to rake in the most money for the least investment, will mate their German Shepherd with one belonging to a friend, relative or anyone they can find without any regard for the genetic traits, health, appearance or other characteristics of the parents. This creates really undesirable trait combinations in the puppies they produce. The end results can run the spectrum from excessively high energy dogs who constantly pace the yard or fence-line or comparatively dogs that are too shy, run away or shut down in fear but they are registered as purebred or full blooded. That’s not the kind of German Shepherd I want - what about you? The German Shepherd should be a strong, confident dog, a happy and healthy animal with lots of playfulness, curiosity, a great disposition, one that responds to the voice of its owner. caveat emptor, latin for - let the buyer beware. I cannot emphasize this enough… One of the largest problems in the regional marketplace is the hundreds of people breeding German Shepherd dogs. A few are good, most are not. Offering stud service or puppies for sale does not make anyone a qualified or competent breeder. Just because a person appears to be a German Shepherd breeder does not make them an honest, ethical person. NOVICE BREEDER / WANNA BE BREEDER There are many people in the marketplace who are acting as a breeder. Yes, they are mating dogs & selling puppies but it is a side job or temporary gig. They had a female German Shepherd dog and because they needed extra gas/cigarette/beer/whatever money - they decided to put their female dog to use to make extra income. They searched until they found someone willing to lend them a male dog for mating purposes and “voila” - they became a back yard breeder. From the start their dog was a very poor specimen which should have never been mated at all. Perhaps that goes double now because the male dog who studded may have been way below-par also. BACK YARD BREEDER Same as novice breeder / wanna-be breeder listed above except now they have acquired their own male. BREEDERS WITH UNSUITABLE DOGS they have skinny dogs, fat but not pregnant dogs, dogs riddled with worms / internal parasites, dogs with skin infections, dogs with washed out coat colors, ones with awful body proportions or having visibly poor genetics, dogs that are mixed with who knows what other breed and they boldly claim that there dogs are champion purebreds. MONEY DRIVEN BREEDER Has placed only a minimal investment in canines, kennel, breeding program or their business, The property looks like a normal house except they have a 10 X 10 chain link kennel or maybe its hooked onto an old shed. UNSCRUPULOUS BREEDER Some of the people acting as breeders may actually fit into several of the categories above. The best case scenario is that you - the German Shepherd buyer do not get your moneys worth and the worst case scenario is that you may get completely ripped off. Simply stated - many so called "breeders" do not have the combination of skills and resources to be a great, reputable, professional & ethical breeder. They do not have the right bloodlines nor the right mixture of information, experience, investment, research, personal or professional ethics necessary to conduct a successful canine business. They may have a few litters worth of experience but what happens when things go wrong? Better yet - what happens when things go horribly wrong? Study multiple sources to learn all about the breed. If you are already experienced with the breed, kudos to you! Make a list of pertinent questions to ask the breeder. Call and inquire with many different canine breeders. Narrow your list down to a few top names, most importantly schedule an appointment for an in-person visit with one or two of the top contenders. Put on your booties, sharpen your pencils, study this guide and do your homework. When you arrive for your appointment - pay close attention to the surroundings. Does the home and grounds speak of cleanliness and order or are there junk piles, an unkept lawn and a general appearance of decay? Do the kennel areas look clean, tidy and awesome or does it evoke the words horrible and disheveled to your mind? Examine the appearance, the quality and demeanor of each of the parents. Remember these should be breed stock level (super high quality) canines. Body proportions - shape, size and weight should easily fit into the breed standard; coat colors should be vivid, not washed out. This is not an all inclusive list. I have intentionally omitted some of the most important items. The back-yard breeder types could simply read this list then re-adjust their programs. Is the breeder pushy or feeding you a sales pitch? Are they talking so fast you can’t get a word in edgewise? Do they tell you - better hurry we only have 2 puppies left? You can’t find this bloodline anywhere else? Or - we have the same bloodline as those other big guys? Not cool. Does the breeder offer multiple breeds? We do Pit Bulls & Poodles and BullDoodles and umm yeah - we just added German Shepherds, but we are really good. After the sale, will the back yard breeder still be in business 6 months from now? Once they have collected your money - will the breeder ignore your phone calls, emails and text messages? How many adult breeding age canines do they have? Do they only have 1 female? Do they have several females but no male? How can you be assured the male that they sent you a picture of - is the actual stud or sire of the litter? Do they have a copy of the males pedigree? Does the breeder have only 2 dogs, one male and one female? What type of German Shepherds do they have & what is the quality of each dog? Some breeders will have a dozen dogs, it’s called window dressing, they have a lot of animals to look legitimate, but the quality of their canines is not consistent. Ask for pictures or look on their website; what do the photos look like? Anyone can copy pictures from social media or a German Shepherd website like Pedigree Database. Are the images cropped where they have been copied from online sources? Do the adults look totally different during the onsite visit when compared to the pictures they sent you? Does the background of the images match the geographical region the breeder operates in? The breeder operates in NC but all of the pictures appear to be taken in the Phoenix Arizona desert. Is the breeder in another state or in an offshore location, but will ship the puppy? What health tests have have been given to the dam / female parent? What health tests have have been given to the sire / male parent? Can they show proof of each health tests? Are there any known genetic problems? What is the age of the adult female? How many litters has the adult female delivered in her lifetime? What is the age of the male used to stud the litter? How many total lifetime litters has the breeder raised? Can they show proof of their previous litters? How long has the person been breeding? Anything less than 8 years, don’t walk away - you should run! Do the adult canines have access to shade or an all weather shelter and a dog house? Is the water dish clean, how about the water itself? Is the food bowl clean? Where do the puppies stay? Are the puppies kept near other dogs? What does the puppy lot & play area look like? How often are these areas cleaned? Are there 3 days worth of stools visible in the puppy lot? Are the puppies clean or are they covered in feces or smell like urine? How often are the puppies de-wormed? What about vaccines / booster shots? Do the puppies have vet checkups? Does the breeder offer a warranty / guarantee? 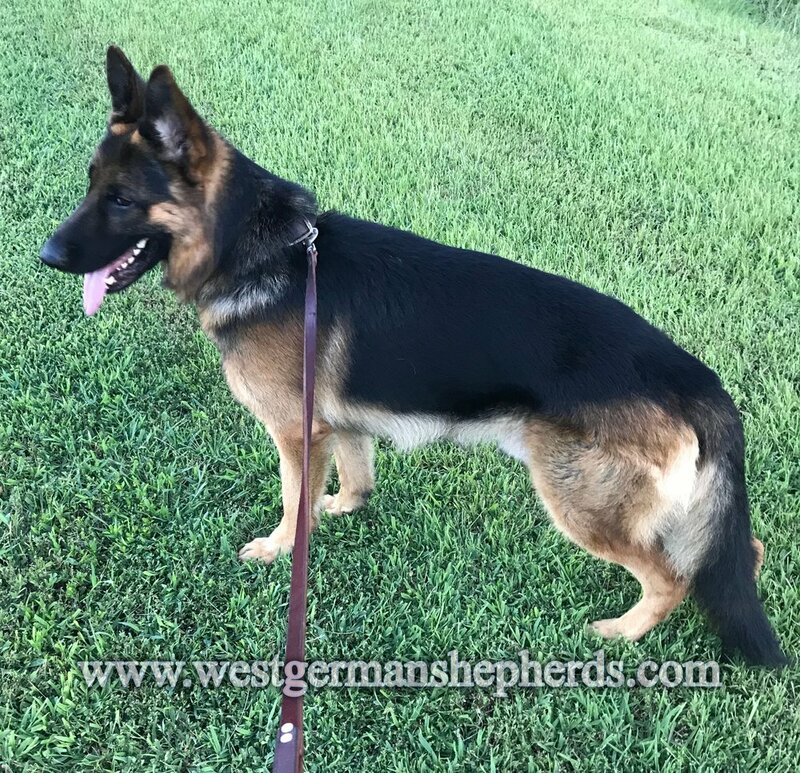 Hopefully you have visited several breeders by now, when compared to the other German Shepherds you have recently seen - how do the breeding pair of adults compare? Are they of much lower quality, the same quality or much better quality? if you had purchased a new puppy elsewhere - would you want you new puppy to stay overnight with this breeder or would you be concerned it would catch a nasty virus or disease? are you afraid your new puppy would be shell shocked after an overnight stay because of the amount of dogs, excessive barking, fighting and mayhem in the kennel? do you feel 100% confident that this person has a strong code of personal & business ethics? Do not base this on what they tell you, rather base this on your life experience and stay true to your instincts. For full disclosure; my dog kennel is located behind my house. I do not want to place my kennels in front of a very nice home. There are miles of difference between a professional breeder who has kennels in the back portion of their property versus a back yard breeder who extracts cash from their canine(s) and has not made significant investments in the dogs, their health, the kennel, the breeding program and their business operations. It is not the the exact placement of the kennel structure that differentiates a professional breeder from a back yard breeder; no, it goes much deeper. It is the mindset, the way they house, treat and care for their animals, how they conduct business operations, whether they stand behind their bloodline after the sale. It is the culmination of everything they do or fail to do. This is what sets the professional breeder apart from the back yard breeder. When you locate a backyard breeder type- it is not your responsibility to make a purchase and thereby save or rescue a puppy. It is hard to walk away from a cute puppy and restart your search efforts. But please consider this - if you make a purchase then you are helping this breeder to stay in business and continue their racket of selling low quality puppies for high prices. If you purchase from these types of breeders then you are helping them water down the gene pool of the most incredible canine breed on planet earth; the German Shepherd Dog! because they can. there are 5 primary reasons for this behavior trait. 1) it's just good, dirty fun; why not use paws for something uh, destructive. 2) to search out food, prey or unique scents; such as grubs, insects, voles or snakes. 3) for safekeeping of treasured possessions (usually food or bones) they hide their valuables from the prying noses of other canines & opportunist like raccoons 4) to allow food items to rot or canker up, they need a certain bacteria level to maintain their stomaches. 5) to cool off - the only way a dog can sweat is to pant or perspire thru their nose and tongue. they will often dig a hole and lay their chest in the bare earth cavity to cool down. of course the well heeled canine will simply convince master - hey dude, i would be awesome lounging poolside. 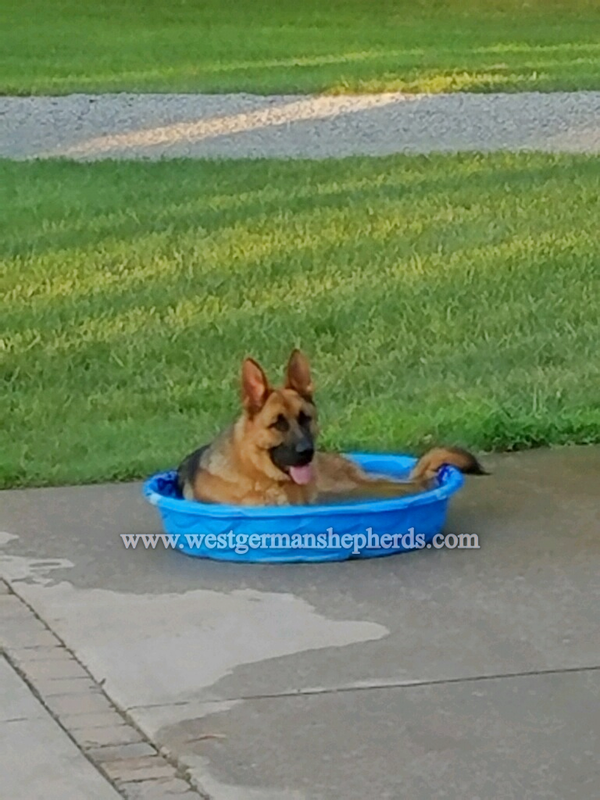 if you can't splurge for an inground pool, no worries; your 4 legged friend can chill for about $10 bucks with a plastic kiddie pool. tips for kiddie pool use: get a small pool. change water daily since they may drink from it too. be sure to use a germ killing cleaning product such as bleach sanitizing spray to prevent harmful bacteria growth then rinse well afterwards before refilling again with fresh water. Men are like dogs, Stacy was fond of saying. And she usually went on to add that, like dogs, they all took up too much space on the bed, and they always went for the crotch. The dog is a gentleman; I hope to go to his heaven not man’s. The great pleasure of a dog is that you may make a fool of yourself with him and not only will he not scold you, but he will make a fool of himself too. A door is what a dog is perpetually on the wrong side of. If you don’t own a dog, at least one, there is not necessarily anything wrong with you, but there may be something wrong with your life. The dog is a religious animal. In his savage state he worships the moon and the lights that float upon the waters. These are his gods to whom he appeals at night with longdrawn howls. In order to really enjoy a dog, one doesn’t merely try to train him to be semihuman. The point of it is to open oneself to the possibility of becoming partly a dog. If you are a dog and your owner suggests that you wear a sweater - suggest that he wear a tail. How many legs does a dog have if you call the tail a leg? Four. Calling a tail a leg doesn’t make it a leg. The love of a dog for his master is notorious; as an old writer quaintly says, A dog is the only thing on this earth that loves you more than he loves himself. Extraordinary creature! So close a friend, and yet so remote. Outside of a dog, a book is man’s best friend. Inside of a dog it’s too dark to read. The dog’s agenda is simple, fathomable, overt: I want. I want to go out, come in, eat something, lie here, play with that, kiss you. There are no ulterior motives with a dog, no mind games, no secondguessing, no complicated negotiations or bargains, and no guilt trips or grudges if a request is denied. Dachshunds are ideal dogs for small children, as they are already stretched and pulled to such a length that a child cannot do much harm one way or another.